The stars were always an interest in my youth, learning about their range in color indicating their surface temperature for instance, the coolest stars are red while the hottest stars are orange. The temps in various stars range from anywhere 3,000 to 40,000 Kelvins. Stars also have different brightness to them. 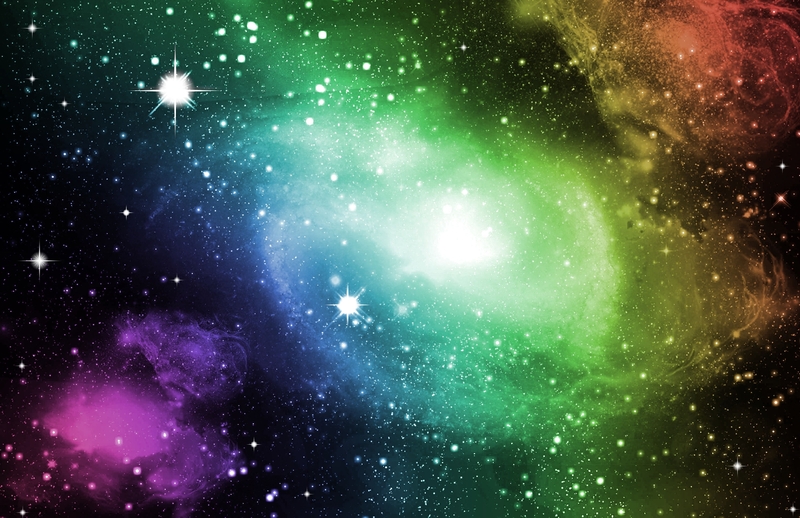 The way scientists can determine how bright a star is, is by color and size of the star. Blue stars shine brighter than cooler red stars which are of the same size while giant stars shine more brightly than little dwarf stars. The common elements which stars of made of are, hydrogen and helium gas. When you combine all the mass from these elements, it creates a gravitational field much stronger than earth’s which prevents the gas from dispersing out into space. Astronomers who embrace evolution, believe that stars randomly form from a collapsed nebula. A nebula is an enormous “cloud” of extremely low-density hydrogen and helium gas. Gravity is required to keep the gas from escaping so compression is required but compression causes other problems. If a gas cloud were to compress, it would cause increased pressure, increase its magnetic field, and its rotation speed which would resist more compression! In other words, these factors would halt anymore compression, thus no gravity to keep the gas from escaping into space. 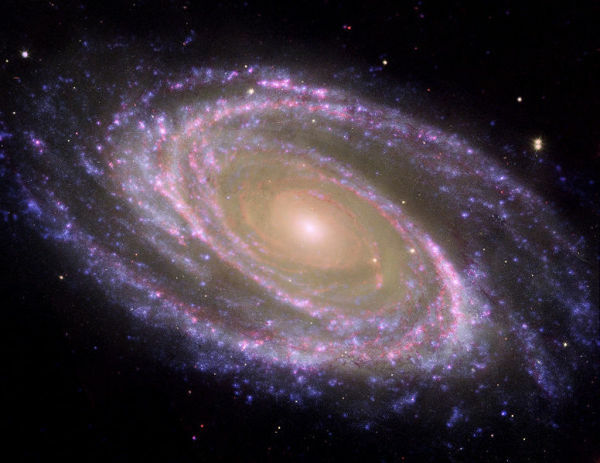 Spiral Galaxies like our Milky Way are a collection of many hundreds of billions of stars which rotate. Since it’s not a solid object, stars rotate at different rates within the spiral galaxy. The stars at the edge revolve more slowly than they do at the center of the galaxy. The spiral arms get tighter with each rotation. What this means is, a spiral galaxy is twisting itself up. How does this relate to confirming creationism? Since these galaxies are wrapping themselves up, if they were many millions or even billions of years old, these galaxies would have wrapped themselves all up beyond recognition but being thousands of years old they continue to display majestic beauty that we can all enjoy and observe! In the beginning of this year, a spiral galaxy known as BX442 dubbed as the ‘grand design spiral galaxy’ was discovered. by a team of astronomers from the University of Toronto and UCLA using the Hubble Space Telescope. Secular astronomers place the time frame 10.7 billion years ago. This discovery falsifies the big bang theory! How? In the Big Bang theory, galaxies in the early universe were not well defined. In the first several billion years of so-called stellar evolution, most galaxies were supposed to be in their infant stages of growth which are suppose to look irregular and unorganized. 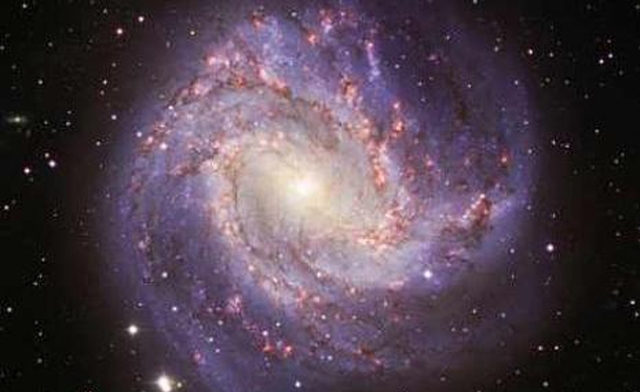 The last thing one expect to find in the early part of the universe is a highly advanced design of a spiral galaxy! So not only do spiral galaxies confirm the universe is thousands of years old rather than billions of years old, it also does not agree with the popular big bang theory on how they appear at various stages in the universe! This entry was posted in Creationism in Space and tagged atheism, christianity, creationism, evolution, intelligent design, science, Stellar evolution by Michael. Bookmark the permalink. Michael claims to have been starstruck as a youth. Apparently he has not read any research about galaxies since the 1960s. The spiral arms get tighter with each rotation. What this means is, a spiral galaxy is twisting itself up. How does this relate to confirming creationism? Since these galaxies are wrapping themselves up, if they were many millions or even billions of years old, these galaxies would have wrapped themselves all up beyond recognition but being thousands of years old they continue to display majestic beauty that we can all enjoy and observe! Actually, the spiral arms do not get tighter.. This is a figment of creationist imagination. If the arms of spiral galaxies were composed of stars, then a “winding problem” may exist. However, spiral arms are not material objects; the stars in them do not rotate around the galaxy center. Instead, the arms are pressure waves, regions of increased and decreased star density. Consider a wave in the ocean. It appears to move toward the beach. However, the water in the wave moves up and down, not forward. Only the wave moves—not the water in the wave. Spiral-arm waves prevent arm collapse, and the gravitational attraction between stars at different radii actually stabilizes the spiral pattern. When there is a problem with a theory, science investigates the anomaly to find an explanation. Creationism merely attributes it to God, and drops the matter. Spiral galaxies do not “confirm” creationism. Get over it. The blog is such a disjointed mess, clearly showing such a lack of understanding of basic astrophysics and cosmology, that I wouldn’t even know where to start commenting. And no clue on how spiral galaxies evolve either … are you trying to wind me up, Michael, by claiming that spiral arms do that ? This blog is one of the most pathetic you’ve written, Mchael, even though that distinction is highly correlated with the fact that you insult all the work done by thousands of astronomers in this field, including myself. Why don’t you start to do some work (and some thinking) for yourself, Michael, instead of blindly copying creatioinst material ? This unnecessary display of gross ignorance *is* insulting to the people who put so much work into this kind of research. The last thing one expect [sic] to find in the early part of the universe is a highly advanced design of a spiral galaxy! The new electric shaver I just ordered from Amazon is touted as having an advanced design. Apparently that means that God designed it. Who would have thought one could get such a high-class product for only $79.95!. If a gas cloud were to compress, it would cause increased pressure, increase its magnetic field, and its rotation speed which would resist more compression! In other words, these factors would halt anymore [sic] compression, thus no gravity to keep the gas from escaping into space. Eelco, did Michael seriously say that? I’m having trouble believing that even a certifiable scientific dunderpate could come up with something so bizarre. I fear I may have confused Michael by analogizing a spiral-arm pattern wave to an ocean wave. An ocean wave is transverse, like a light wave. But a spiral-arm wave is longitudinal, like a sound wave—that is, the particles (stars) move back and forth in the plane of the wave. Think of a traffic jam, where the cars normally move fast, but some of them move slower. At the back of a jam, the cars have to slow down, increasing the car density. At the front, they speed up, decreasing the density. In a spiral galaxy, where the faster stars rotating around the center are forced to slow down, their increased density makes them visible as a spiral arm. As the stars leave the arm at the front of the arm, they speed up, lowering their density and thus becoming less visible. Therefore, the stars themselves move at rates different from that of the wave that forms the arm. The arm is always there, but the stars in it come and go. Do evolutionary theorist Andy Gardner and theoretical physicist Joseph Conlon understand what Darwinian evolution is? What I mean, in the past, you get on my case for using the term “evolution” broadly. Questioning my intelligence. Those two Oxford scientists proposed “Cosmological natural selection” and what do you think of that? Are you going to question their intelligence for how they view evolution? I do not think you understand your own theory rather it’s to keep the paradigm going using unverifiable speculation. For example, Globular clusters supposedly evolved at the same time, right? Then how did two different histories get into the mix? There are blue supergiant stars which look too young to be in supposed old clusters. In other words, these new observations are not part of your theory in which you believe! Not only that but these blue supergiant stars are all over the place from cluster to cluster like a mix bowl of soup. The explanation is that you “tell” this how it supposed to happen (keeping the paradigm going) rather than “show” how it happens. When a theory has a history of increased complexity due to falsifications, that is a confirmation that the theory is not factual. Another article in April, Science Magazine says Dark Matter is approaching it’s moment of truth because it has not been directly detected despite the fact that there is supposedly more of it than visible matter in the universe. One team thinks it may have the ability to detect it, directly! I thought you said it has already been directly detected! Are they wrong? It was promised that Planck was going to confirm the big bang theory but Astronomer Paul Steinhart discovered “serious difficulties” with the hypothesis of “inflation” as new data from the Planck telescope was revealed. Planck seems to have confirmed the presence of a “preferred direction” in space which is what? Yes! It’s a violation of the so called “Copernican Principle” that says every direction should look the same. The biggest thing discovered in the universe defies a theory in which you believe in. Four billion years across, this huge Large Quasar Group is not supposed to exist according to your secular Cosmology. It creates a “mystery” (a project to keep a paradigm going) rather than confirm a theory. The Lumpiness Problem in cosmology remains for a model which says structures do not reach over 370 Mpc. This new falsification has open the door to try and find even larger objects which is good science, the belief on how it evolved is not. And the list goes on and on…No, you do not understand your own theory! You only work on how to keep it alive! Another example—as if we needed one!—of Michael’s penchant for distorting science. Gardner and Conlon wondered whether some of the concepts of biological evolution might be useful in studying the development of the universe, specifically some of the math. They came up with a speculation that black holes might produce new universes by natural selection, and clothed it with Price’s equation for Darwinian selection. But, in your zeal to tar cosmology, remember that: (a) they assume multiple universes, without any further evidence; (b) they assume, with no evidence, that black holes produce new universes; (c) that the “fitness” of a universe can be measured by how many black holes it produces, and therefore how many new universes it can spawn. This idea of cosmological natural selection is controversial, and physicists have pointed out all sorts of problems with it. But we were interested in seeing if its basic evolutionary logic actually works. “Controversial” is much too mild a word. Like any scientific speculation, it may conjure up ideas for further research. But few if any other cosmologists give this hypothesis any credence whatever. This does not call into question the authors’ intelligence or their knowledge of evolution. It’s only that they are most probably wrong—and they themselves admit it. Michael’s interest in this was no doubt piqued by characterizations in the popular press that this speculation shows that tour universe was “designed” to produce black holes, or that its “purpose” is to make them. This emphasizes the danger of cherry-picking terms with no understanding of what they mean, or of their context. At any rate, Michael has demonstrated yet again his abysmal ignorance of the scientific process. The origijnal paper is available on-line: Gardner & Conlon “Cosmological natural selection and the purpose of the universe” Complexity 18:5:48-56 (Masy/June 2013). It is ironic that Michael should jump on this hypothesis, since it absolutely requires multiple universes, a concept which Michael abhors! Maybe he didn’t read that part. No, that’s what happens when a supposed Lutheran ID evolutionist does not understand metaphor. Spiral-arm waves prevent arm collapse, and the gravitational attraction between stars at different radii actually stabilizes the spiral pattern. Michael did not attribute anything to God. Creationism does not merely attribute anything to God. You have created a straw-man. Shocking I know! Galaxies cannot confirm anything. No interpretation of spiral galaxies in and of itself confirms creationism, but neither does it confirm evolution. A speculative non-testable science like cosmology cannot ‘confirm’ anything but can simply make arguments for a position, which might be discarded as more information becomes available. Why don’t you start to do some work (and some thinking) for yourself, Michael, instead of blindly copying creatioinst (sic) material ? This unnecessary display of gross ignorance *is* insulting to the people who put so much work into this kind of research. There isn’t much creationist material on spiral galaxies for Michael to copy from and his post does not seem to have been copied. However, since you know which creationist material he copied from, please link. I am also quite disappointed that you have not taken this opportunity to educate him given that you should be the specialist here. You could look it up. Phillipps, The Structure and Evolution of Galaxies (Wiley 2005), pp132-133.. I don’t have a copy, but Eelco probably does. I haven’t read the book myself, but here are some passing thoughts. Also, the increased star density in the arms promotes the formation of new stars there, so that less of the gas escapes the high-density portion of the wave than enters it, thus increasing the gravitational effect and raising the density (and visibility) of the arms. Just a guess. Eelco no doubt has a much better answer. This effect would not occur in a sound wave, since the air particles have no appreciable attraction toward each other. Thanks, can’t find the book but I’ll survey some alternatives. What say you Eelco? No. Why would that be ?? Why can’t you have young and old stars together ? Age discrimination, Michael ? BTW, the age of a cluster is just that: it tells you when the cluster formed. Not when all of its stars formed (most are old, not all, obviously). I do not believe in theories, that is not at all how science works. So what is the problem with inflation again ?? The ‘axis of evil’ (what a stupid name …) is by no means certain, though. Only some people claim to see this in their analysis. I’m not convinced, like many others. So, in all, I have to conclude again that it is you who haven’t got a clue what is going on in cosmology and galaxy formation. I do not know why you now feel the need to tell me I don’t understand the subject I’ve been working in for 25 years, like thousands of other astrophysicists. You do not work in the field, don’t bother to read any background, but just copy stuff from creationists websites and popular science sites. Very, very disappointing. You were always quite polite before, but I don’t see much evidence of that now, Michael. Indeed. Fun idea, interesting to see where it leads, but that is really all. Very few people take it seriously, but if one or two people want to work on this, fine. A few more words in Michael’s text would need replacing, like ‘compress’ into ‘collapse’, etc. Oh, and it actually helps that star formation is not always so efficient: our models for galaxy formation and evolution would not work so well if it would be. One very simple fact: one rotation of our own galaxy takes about 250 million years. How do you want to wind up our galaxy in 6000 years, Michael ? When it has only rotated a tiny little bit ? The ‘spiral galaxies wind up too fast’ claim still seems to be all over the creationist websites, if you do a google search. Yes, I know that there is said claim. My problem is that you make it sound like his reasons for supporting said claim are also copied. I don’t think they are. In the beginning of this year, a spiral galaxy known as BX442 dubbed as the ‘grand design spiral galaxy …. Michael misunderstands basic astronomical concepts again. BX442 is not the grand design galaxy—it is a grand design galaxy. A grand design galaxy is a spiral galaxy having prominent and well-defined arms. About 10% of all spiral galaxies in the observable universe are grand design galaxies. Grand design is not unique to BX442. What is unique about BX442 is that the spiral structure formed so early. Michael says this would be impossible unless it were younger. But here again he displays ignorance. More than ignorance, because the articles that describe the discovery of BX442 also describe how it most probably formed. As noted previously, spiral arms are density waves, rather than fixed collections of stars. But any kind of wave requires energy to get it started. BX442 is the only grand design galaxy among 300 observed at redshift > 2 It is also the only such galaxy having a near neighbor, a small galaxy about 5% of it mass. Now, among galaxies in general, such a companion galaxy is one of several mechanisms for triggering the density waves that form spiral arms. This mechanism does not depend upon the ages of the galaxies; gravitational tides from the companion can form density waves at any time. Voilà. BX442 is the only early galaxy having a grand design structure. BX442 is the only early galaxy having a companion galaxy. Companion galaxies, even small ones, trigger the formation of grand design in any galaxy. No young age required. Michael professes a fascination with stars. Most people who are fascinated by a subject try to learn something about it, to understand it. Not Michael. He seems content with a slack-jawed bewilderment. Michael is just copying Russell Humphreys claim. Read your favorite creationist website to look it up. ID advocate Guillermo Gonzales has been appointed an assistant professor in the physics & astronomy department of Ball State University, in Muncie Indiana. Several years ago, Gonzales was denied tenure in the astronomy department at Iowa Stae University. ISU asserted that the denial was caused by his lack of recent publications and failure to attract grant money. The Discovery Institute, where Gonzalez is a Senior Fellow, claimed that his support for intelligent design precipitated his ouster. Gonzalez next appeared in the astronomy department. at Grove City College, a small religious school in Pennsylvania. Grove City College has been on the American Association of University Professors’ list of censured administrations since 1963—longer than any other institution. Most of the violations were for denying academic freedom. At Ball State,Gonzales will teach two introductory astronomy courses. The hiring occurred shortly after a publicized investigation into BSU astronomy professor Eric Hedin, who was accused of teaching ID in a science class. BSU denies that they are attempting to establish an ID research center, as charged by Jerry Coyne.. Discovery Institute VP John West said the had never even heard of BSU until Gonzalez was hired. Nah, before my time, I’m afraid. Well, then. here’s a movie that’s not a musical, but is chock full of music. “Quartet” takes place in a British home for retired musicians, mostly opera singers. Three of them want to put together the quartet from Rigoletto for their annual fund-raiser. When a noted coloratura arrives to live at the the home, the quartet would be complete. Except for the fact that the baritone used to be married to her, and still retains a large amount of ill will. For her part, the coloratura is arrogant and haughty, and announces that she has given up singing, The rest of the movie is an ultimately successful attempt to stage the Quartet. All of the “retired musicians” (except for the four main characters, are not actors at all, but are actual noted retired musicians, The credits at the end shows them now and in their heyday, with the groups they performed with. The end of the movie shows the four singers on stage, As they begin to sing the quartet, the screen blanks to the credits, but the full piece is performed as the credits roll. Oh, yes. The last line involves the bass proposing to the coloratura, and her acceptance. Some of the characters are funny and poignant. The tenor in the quartet had a stroke, and in his own words, “lost his self censor.” So he flirts unendingly, pees in the bushes, and generally says what ever he thinks. The alto is in the early stages of dementia, and sometimes forgets where she is, or places she should go to. An arthritic former concert pianist plinks away at a Steinway keyboard. As she tries harder and harder, the notes of Bach’s Great Fugue in G swell from a distant background to room-filling crescendo. Oh, yeah; this movie is directed by Dustin Hoffman—the first movie he has aver directed … at age 75! I found this other blog post talking about galaxies that I thought was interesting. Check it out.